I’m seeking beta readers for a 75,000-word gay romance/horror novel. Contact me if you’re interested in being a beta reader or writing a book review. Thanks. Jarod Huntingdon wants more than anything to have a family with children of his own, yet he’s unable to commit to his girlfriend and doesn’t know why. He returns home to the remote rural community of Annastasis Creek for a season of soul-searching where he encounters his childhood friend, Scotty McPherson, and—despite their high school fallout—Jarod finds he’s still attracted to him. When Scotty’s six-year-old niece, Madison, goes missing, a frantic search ensues. A violent rainstorm traps them in the valley, blocks roads, cuts off all communication, and hampers the hunt. In the meantime, Jarod learns of a curse as old as he is, first placed on the community after five young people perished in a house fire during the sacrifice of a deformed child. As the curse takes hold, the dead return to abduct the living, and the abducted turn into monsters. To appease the curse, defrocked Pentecostal pastor Uriah Zalmon must find another sinner to sacrifice. The Covenant Trustees unanimously select Scotty. Who better to play the scapegoat than an “unrepentant homosexual”? Faced with losing the love and support of his family and community, Jarod must choose between the life he’s always envisioned and saving Scotty from being sacrificed to a great winged beast hibernating in the bowels of an abandoned church. Can he rescue his true love and break the curse once and for all? 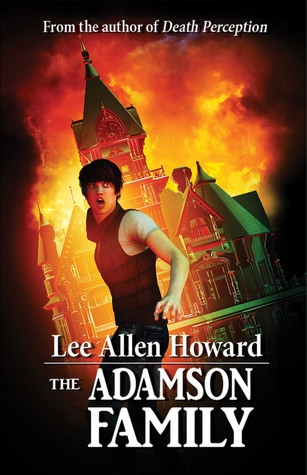 I’m giving away three copies of my YA supernatural, The Adamson Family, from today until November 16, 2017. Click to enter! Giveaway ends November 16, 2017. Get THE ADAMSON FAMILY now! Vampires, beasties, zombies, ghouls… and the murderous kid next door. Twenty-four stories of human and supernatural horror and crime will chill you to the bone. Can you escape the perpetual nightmares? This collection is now available in trade paperback (322 pages) from Three First Names. I’ve been hard at work collecting all my short fiction into one book, due out soon from Three First Names. It’s been a long time since I’ve posted, so I thought you deserved an update. I’ve been hard at work this year writing non-fiction. I recently released The Surefire Method of Growing Rich, a metaphysical guide to living the abundant life. This month I’ll be coming out with a trade paperback version of Response to a Concerned Heterosexual Christian, which is newly updated for Kindle. I’m also working on a biblical study of everything the Bible has to say about Sodom and Gomorrah, as well as a biography/social commentary on a hippie evangelist from the Jesus Movement, Lonnie Frisbee. You must admit, I’m eclectic. I’ll keep you posted as things get published. In the meantime, thanks for your support! I still love reviews on Amazon and Goodreads!